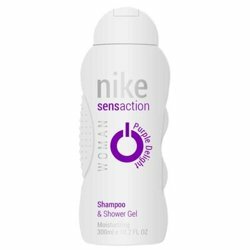 Nike Nike Basic Purple, Passion For Vanilla - Deo, Shower Gel And Loofah Combo DeoBazaar.com. 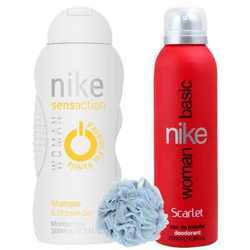 Nike Basic Purple, Passion For Vanilla - Deo, Shower Gel And Loofah Combo For Men @ Best price in India. 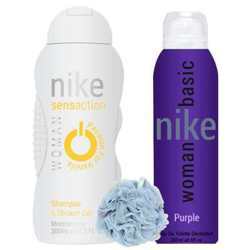 Buy Nike Basic Purple, Passion For Vanilla - Deo, Shower Gel And Loofah Combo 175 ML For Men just Rs. 399/- Online From DeoBazaar.com with Best offers, discount, COD(Cash on Delivery) and Free shipping across in India. Product #: Regular price: Rs.650INR499(Sale ends 01 January ) Available from: DeoBazaar.com Condition: New In stock! Order now! Explore Nike | More Combos And Giftsets | Why shop from us? For the active women who wishes to lead her life to the fullest, Nike gives this refreshing Combo that offers a fresh and unique fragrance during and after bath. The fragrance holds fresh mandarin, bergamot extract with notes of wild mint, grapefruit, and orange tree & combines with notes of lavender and reseda in the heart. The base is created of vetiver root, amber, musk & vanilla. Hit your refresh button with this amazing combo of Nike shower gel, deodorant & loofah.